OMG Posters! » Archive "Han Shot First" Star Wars Print by Florian Bertmer (Onsale Info) - OMG Posters! As the end nears on the Alamo Drafthouse Star Wars print series, the releases just keep getting better and better. Florian Bertmer’s “Han Shot First” is a 24″ x 34″ eight color screenprint, has an edition of 400, and will cost $50. It goes up Thursday, December 2nd at a random time. Visit Mondotees.com. Wow! I love this one. It’s been a great series but this one would be really great to grab. 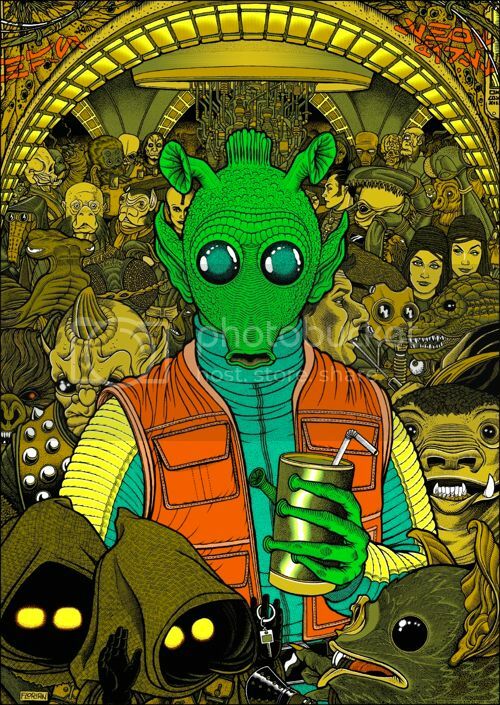 Love the contrast between Greedo and the other Cantina patrons. Plus what an astounding amount of detail! The expressions on the twins’ faces, Garindan, Hammerhead, the guy with the glowing red eyes. I can practically hear the creepy laugh at that moment. And the Jawa getting stuck up for his “car” keys?! Ahaha! Want! Florian’s detail is nothing short of amazing. I love this print. I bet in person the colors LEAP out at you. My only gripe is the straw. Just feel he’d look more menacing w/o it. Gonna be hard to NOT pull the trigger when this drops. 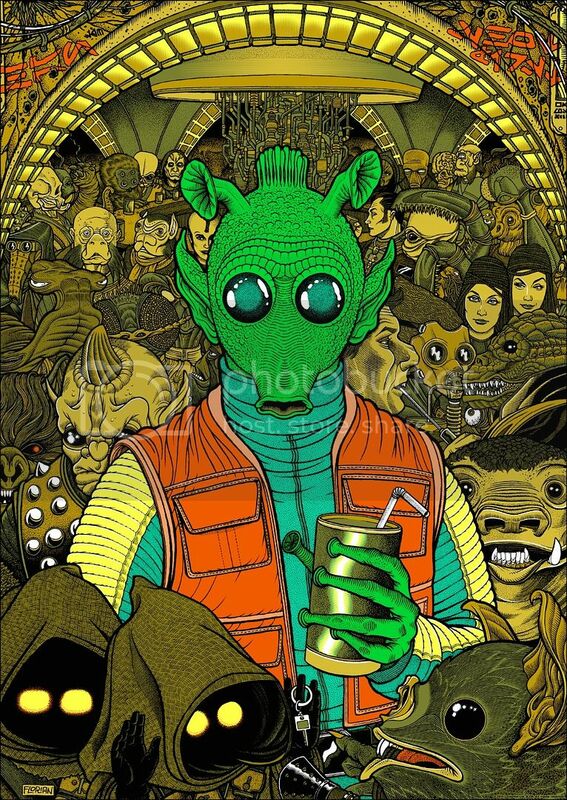 I do love the detail on this, the colors, the Jawa and his keys, the bendy straw; unfortunately I’ve got to be really picky because this series is just so massive and I don’t have $64 to drop on a new print every week for 4 months. Great job though, certainly in the top tier of the series. Speaking of which, I have a Dawn of Tattoine that I’d let go of (listed on expressobeans), not trying to flip it, again, it’s just that I’ve kind of overspent on this series. Still pumped about getting an R2 last week, I can’t wait to see it in person. I love everything about this one–except the size. It’s two inches too short to properly fill a 24×36 frame, which is a wee bit irritating. But dimensions aside, I was hoping to see Florian Bertmer involved and this poster is probably the most fun entry in the series so far. This seems like another one that will be captivating in person. Don’t particularly care for this image. While the whole han shot first thing is huge in the star wars annals, we already got a truly mind blowing print from Martin ansin in the cantina, another one seems kind of unnecessary to me. I personally really enjoy Florian’s style, his Evil Dead, Night of the Living Dead, and Necromancer prints are gorgeous, however this one just doesn’t do much for me. I can’t wait till this series is over so we can go back to getting real movie posters. I haven’t been a fan of star wars for quite some time (since the prequels came out), so it will be nice getting back to actual movie posters for real screenings of movies. I’ve seen a few comments here and there from people who want the Star Wars stuff to end so Mondo can get back to doing movie posters, and I sympathize with those who aren’t interested. However, I think that in the past two months, there have been about three non-Star Wars posters for every one Star Wars release. So the overwhelming majority of their posters this fall have not been in the Star Wars series–it’s just that the ones that ARE tend to get a lot of publicity. Don’t get me wrong, there have been some really amazing prints to come out of the series. Jabba’s Palace, Luke’s Destiny, Wretched Hive, Lynch Pin Droid, and even Attack Position are all incredibly gorgeous pieces of art. The artists should all be proud as they have produced some truly amazing art, which is in my opinion some of their best work. Unfortunately I’m pretty dissatisfied with the direction the star wars series took after the original trilogy, and it pretty much ruined my enthusiasm for the franchise as a whole. It seems silly to hang something on my wall for a series I no longer care for, even though I really enjoy the artists take on the universe. While there have been several non star wars prints to come out since the series started, the major drops every week from the biggest artists are star wars posters. I’d much rather see ansin do another universal monsters, bertmer do another cult classic horror movie, than all these huge artist devoting their immense talent to star wars posters. Like I said, love the art, hate the franchise, can’t wait till its done. I think this a really good poster. You are spot on, Jared. The art is fantastic, but I could never buy anything Star Wars related ever again. The fact I even contemplated picking up Ansin’s piece speaks volumes. Thanks Jon, I felt the same way that it really speaks to the quality of the art, that I wanted to get almost all of these. However, as some one who is no longer a fan of the series, it seemed better to save the money and leave them for the fans. Justin announced today that they are going to start doing a director’s series of prints, with the first being the films of Guillermo del toro. I personally can’t wait for this, as Guillermo is one of our visionary directors. Blade 2 is the first, then the hellboys, pans labyrinth, chronos, and devil’s backbone. I can’t wait for the series, as Ken’s Hellboy 2 print showed on EW looks totally disgustingly sickhouse!!!! Not a huge fan of Star Wars but I am a fan of Bertmer’s work. However with the new Ouija board he did dropping hopefully any day now I am going to have to pass on this. Nicely done print though. Might try and get it for artist completion sake, down the road. You obviously didn’t read anything I said, so I shouldn’t even dignify your mindless comment with a response, but I will any way. I clearly said more than once I actually find the star wars prints quite amazing, the artists are putting out some of their best work, and even went as far to say that I wanted to buy almost all of these. They are all however, art prints about star wars, a series I no longer care for. I buy mondo’s prints because they are movie posters, advertisements for actual screenings of films. They condense the major elements, images, and themes from the movie down to 1 image chosen to represent the film to the viewer (which I find far more interesting than something that is essentially high end fan art). I would rather have posters for a bunch of different movies all over my house, than have my walls covered in a bunch of star wars art prints…. “my apartment is starting to look like a star wars art gallery” I can honestly say this is not a good thing to me, even for some one who might enjoy star wars, its overboard. As for hellboy, its a badass piece of art for a movie I series I enjoyed, why do you need a break for that (its not like I was getting all hard over the blade 2 print….)? Guillermo has proven himself as a visionary director, with more depth and creativity than Lucas has in the last 30 years. I also think the poster looks a lot more interesting compositionally than what ken submitted for the star wars set. Just because we don’t share an opinion doesn’t make it ok for you to bash mine. Damn, did this really sell out? Had it in my cart for a second. Was gone by the time I signed in. The artwork in this one is really sensational. A wonderful edition to the Star wars series. Mr. Bertmer is extremely talented.